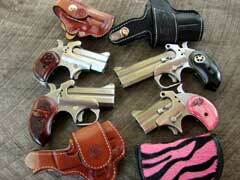 An assortment of Bond Arms derringers. 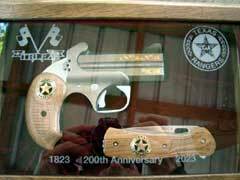 Bond Arms' Texas Ranger Commemorative. 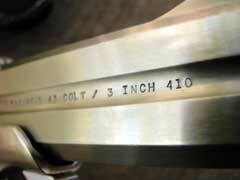 USA Defender 45 Colt / 410 Shotshell. 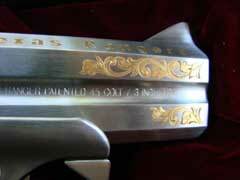 Bond Arms makes the world’s best derringers. That is a strong statement, but to anyone who has handled and fired one, it is a true statement. 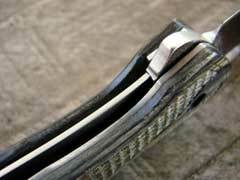 Made of stainless steel, tightly fitted and beautifully finished, the Bond derringers are strong and powerful. I have owned my Snake Slayer for almost three years now, and it has proven to be a handy and reliable weapon. 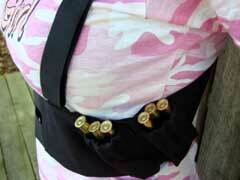 I carry mine often when out in the woods during warm weather, when rattlers, copperheads, and cottonmouths are crawling. Around the farm, these creatures like to lay under equipment and such, and I won’t tolerate them around the area where my grandkids and their wonderful grandpa play and work. Loaded with a payload of 410 number 8 shot, the Bond makes quick work of dispatching venomous snakes. 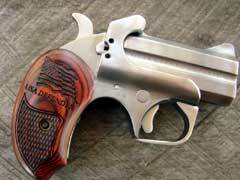 A Bond derringer is also very handy to wear while driving. 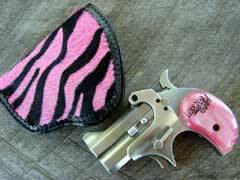 I carry mine is a Bond driving holster, which is a cross draw that holds the weapon horizontally on my belt, just to the right of my belt buckle, me being a left-handed shooter. A three inch 410 shotshell loaded with five pellets of 000 buck or something like the Winchester PDX1 makes a formidable car-jacker repellant. 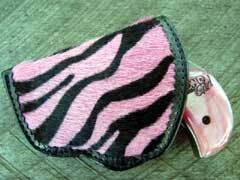 Even a load of birdshot at close range into the face of an attacker is very effective. I have covered most everything in detail on the Bond pistol before in my review of the Snake Slayer, so I won’t plow that same ground here again. In that review, I mentioned the wide assortment of Bond derringers available, and in this piece, I will spotlight just a few. 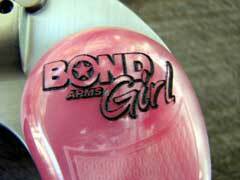 First up is a Bond Mini with some pink grip panels. 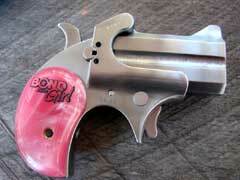 This is the "Bond Girl" gun, and has really been a hit with the women to whom I have shown it. Pictured here, the Bond Girl pistol is chambered for the 38 Special/357 magnum cartridges, but as with any of the Bond Derringers, switching to another set of barrels is very quick and easy to do. 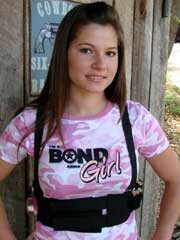 Nicole really liked the Bond, and shot it very well, both with the 38 Special cartridge, and then also with the three-inch 410 shotshell, after switching barrels with my Snake Slayer. 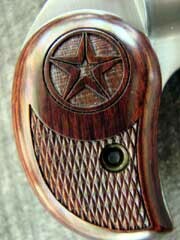 Also shown here is a Bond Mini chambered for the 45 Colt cartridge. This weapon has barrels that are too short for the 410 shotshell, and is a good choice for those who want only to shoot the 45 Colt cartridge. 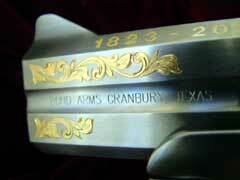 Again, extra barrel sets can be purchased to allow the use of several different cartridges on any one Bond frame. 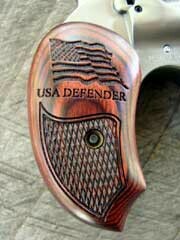 Another derringer shown here is the Bond USA Defender. It is chambered in 45 Colt/410 shotshell, but with shorter barrels, to use the two and one-half inch shotshell, sacrificing a bit of shotshell payload for better concealability. 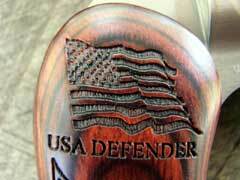 The laser-engraved grip panels are beautiful, with the American flag replicated on the laminated wood. My favorite of the guns shown here is the Ranger II. 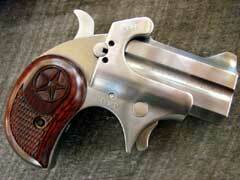 It is also chambered for 45 Colt/410, and has a trigger guard, which distinguishes the Ranger II from the Ranger. 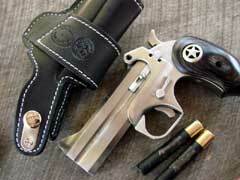 The black grips look good with the stainless pistol, and the black driving holster is both beautiful and functional. 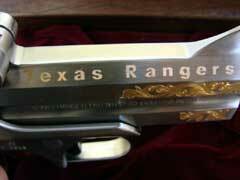 Well-balanced with its longer barrels, the Ranger II just feels right to me. 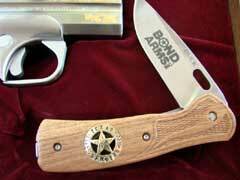 The special cased gun and knife set shown here is Bond’s tribute to the Texas Rangers. Not the baseball team, but the special division of the Texas state police. 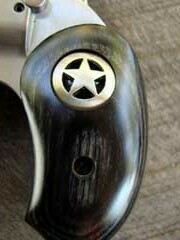 As indicated on the upper barrel, The Rangers have been in service since 1823, commissioned by Stephen Austin, and have been around almost continuously ever since, except during the reconstruction period after The Confederate States were aggressively invaded from the north and lost that war, along with their sovereignty. 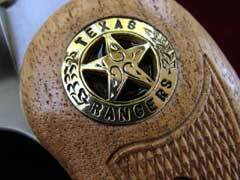 The Texas Rangers are some of the most respected law enforcement officers in the nation, and have a colorful and interesting history in the formation of the Republic of Texas, as well as the state. 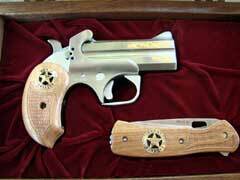 The Bond Texas Ranger derringer in the cased set is chambered for the 45 Colt/410 Shotshell combination. 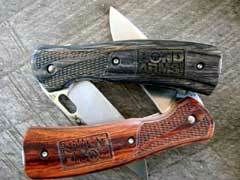 It comes cased with a special Buck knife, laser-engraved with the Bond Arms logo. 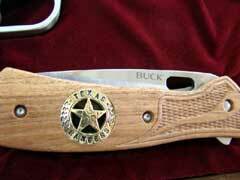 The pistol grip and the knife scales are made of Texas mesquite wood, and have replica Texas Ranger badges inlaid. This is a good-looking, highly collectable Bond derringer with special serial numbers, and is available for a limited time. The pistol commemorates the 200th Anniversary of the Rangers, which is still twelve years away, but the pistols are only available for a limited time. I like the idea of having the guns done early. 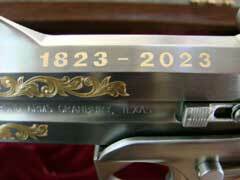 Many times, gun manufacturers will issue a commemorative, and by the time it finally gets into production, the anniversary has passed. Bond is thinking ahead on this one. 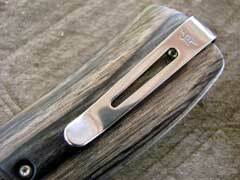 Anyway, it is a beautiful gun and knife set, cased with a glass top, and in production now. 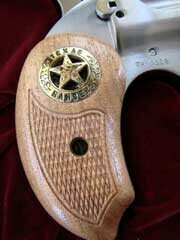 These Texas Ranger sets can be ordered direct from Bond Arms, and they will take care of getting it delivered to your gun dealer. 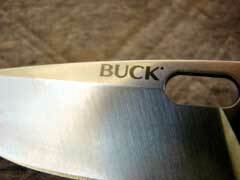 Speaking of knives, Bond now has commissioned Buck to produce knives for them. 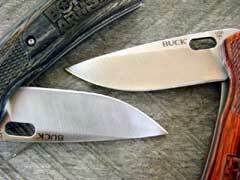 I remember a time when just about everyone carried a Buck 110 folding knife. 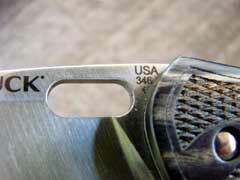 These Buck knives that bear the Bond logo are made in the USA, open quickly, and lock open for safety. The three and one-quarter inch blades are stainless, and the scales are available in laminated rosewood or black ash, and have a stainless steel pocket clip. 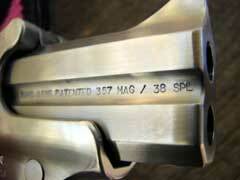 Like all Bond derringers, the ones shown here are fine examples of craftsmanship, and are made in the USA. 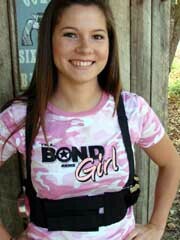 Check out the line of Bond firearms, knives, holsters, and accessories online at www.bondarms.com. 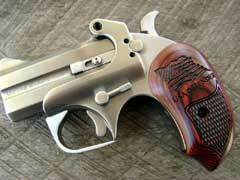 "Bond Girl" Mini 38 Special / 357 Magnum. 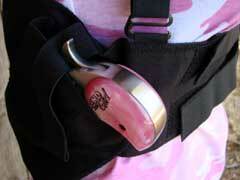 "Bond Girl" Nicole models the Bond Girl derringer in a Kangaroo Carry Liminator concealment holster. 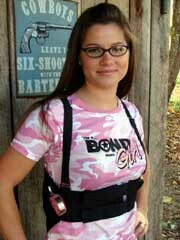 Designed to be worn under clothing, the Luminator comes in pretty handy for carrying the Bond derringer plus extra ammunition. 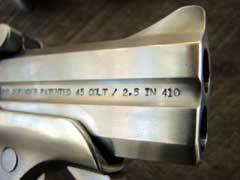 Ranger II 45 Colt / 410 Shotshell.